When I saw that Elvis Costello was going to be performing in Northern California the same time I was making my quasi-annual pilgrimage to the homeland, I knew I wasn’t going to pass that opportunity up. Especially as he was on his “Spectacular Spinning Songbook” tour, a unique vaudevillian experience where Costello played the carnival barker and let the audience choose the set list. 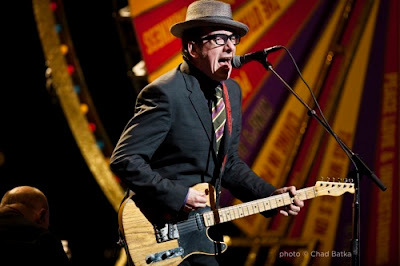 I’ve seen Costello play twice now, in Oregon in 2002 and San Francisco in 2012, and each time it’s been one of the best concert experiences of my life. The man puts 110 percent into each and every performance, and is a true showman. For my money he’s got one of the richest songbooks in popular music, from the angry young man “My Aim Is True” era to the stately chamber pop of “Imperial Bedroom” to the twisted rage-rock of “Brutal Youth” to the bittersweet country rock of "National Ransom." And at San Francisco’s historic Warfield theatre the other night, Costello traveled through it all. The “spinning songbook” is a gimmick he briefly used back in the 1980s and has revived for his new tour, a “Wheel of Fortune” style device that audience members are invited to spin, and wherever it stops, Costello plays a tune. Costello adopts the huckster persona of “Napoleon Dynamite” (which predates the kitschy movie by years, thanks) and the stage includes such oddities as a “society lounge” bar and a go-go dancer cage eager fans are invited to enter. It all rides the line between cheesy and cool but Costello delivers it firmly tongue-in-cheek. Even the go-go dancing cage worked, and we got to see some truly terrible white folks' dancing from some of the audience members, but everyone was having a blast. The Imposters were in great form too, especially the invaluable Steve Nieve on keyboards (and occasionally, a great theremin). Costello and the Imposters were on fire from the start, blasting out with a mini-set that included a roaring “Lipstick Vogue” and a sprawling “Watching The Detectives” before the wheel-spinning began. Selections on the wheel included individual songs and “theme” picks like “Time” or “Roses” that would launch a few grouped songs. 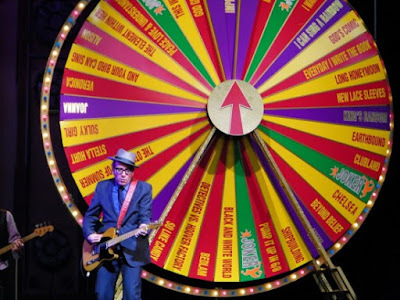 Having ordinary folk come up and interact with Costello made the concert have a nifty community feeling, and the wheel made the concert a nice mix of classics and rarities and some great covers. A dynamic version of “Episode of Blonde” saw Elvis wandering the entire audience as he sang, even coming up onto the balcony not 10 feet away from me. The concert really had me once again appreciating Costello’s vast resume of songs – “Everyday I Write The Book,” a haunting “Deep Dark Truthful Mirror,” fierce takes on “Mystery Dance” and “Radio Radio.” It also opened my eyes to how good Costello can be at covers, and his deep appreciation of other artists. Few musicians have such eclectic tastes from country to opera to pop, and this night Costello took on the Rolling Stones (a wonderful, singalong “Out of Time”), Chuck Berry (“No Particular Place To Go”), an utterly joyful Beatles “Please Please Me” and a song that particularly appealed to this Bay Area crowd, the Grateful Dead’s “Ramble On Rose.” By the time it wrapped up after 2 ½ hours with a boisterous “(What’s So Funny About) Peace, Love and Understanding,” we were all converted to the Church of the Spectacular Singing Songbook. It was a great show – the only flaws being that my balcony seat kind of obscured the colourful wheel and that people around me couldn’t stop fiddling with their damn iPhones during the show (hey, I love my iPhone too, but I’m able to stop playing with it sometimes). Oh, and after the show I had to walk across town through San Francisco's seediest neighborhood The Tenderloin at nearly midnight, but hey, I survived! So, our car was stolen last week. Evaporated into thin air in the middle of a nice afternoon, parked on the street one moment, gone the next. It was our “second car,” the one my wife has been using, and nowhere near new, but still quite a shock to find it gone so quickly from our life. Fortunately it was insured, fortunately it was old, and fortunately nobody got hurt (“carjacking” is pretty darned rare here downunder). But it still highly irritating, to find yourself victimised by some complete stranger, likely some “boy racer” type who’s taken our Subaru and zipped it around Auckland until they run into a tree, or taken it to a chop-shop for spare parts. I don’t imagine we’ll ever see it again, and frankly I’d rather it just disappeared instead of turning up ripped to bits. 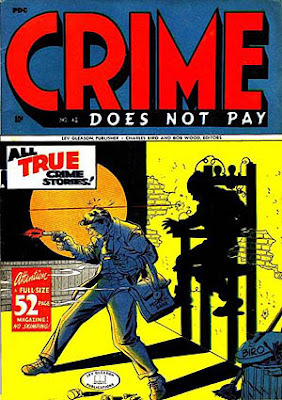 For someone who reads an awful lot of comic books about brightly clad heroes beating up the bad guys, I actually haven’t been the victim of much crime so far in life. In fact, I’d pretty much never been robbed/burgled etc. before we moved to Auckland. That’s not meant to be a slam on New Zealand, actually – in America, I always lived in smaller towns, but here, I’m in a city of 1.5 million, and I imagine any equivalent size city in the states has its own problems. Any image you might have of New Zealand as some crime-free paradise is a bit too utopian to really believe. In the nearly 6 years we’ve lived here, we’ve had one car’s window smashed in (for about $2 in pocket change sitting in the car) and now the other one stolen. I was actually far more irritated over the broken window than I was over the entirely stolen car – mainly because the former incident happened in our own driveway, while we were sleeping, and some worthless dirtbag was rifling through my car. The other happened across town, on an ostensibly “safe” street, so it didn’t feel quite so intimate. But while I’m annoyed I’d say I recognize that on the general scale of crime this ranks pretty low – I’ve never been physically attacked, and (knock on wood) our house has never been burgled. It does make you feel more sympathy for those who are the victims of crime – and more disgust at the kind of lowlifes who think it’s a lark to steal a man’s car. Sigh. Where's Batman when you really need him?